Our alarm sounded at 5:00am, although we were already awake. It was still very dark outside the tent and when we unzipped the rain fly we found ourselves surrounded by thick fog. We could hear a few other campers stirring, but for the most part it was dark and quiet. Now to figure out how to get the tent packed up, get to the restroom and find our guide Wilson without breaking the number one rule: don't walk around in the dark. We had no choice, so being as quiet and careful as possible we packed up the tent, a miserable job in the cold mist. Everything was wet (it had rained during the night) and we tried not to disturb our neighboring campers while we fought with the slippery tent cover. The fog was so thick we couldn't see across the campground, our headlamps only lit up a small area in front of our faces. We held onto our bladders as long as we could but finally had to make our way across the grass the quarter mile to the restrooms. 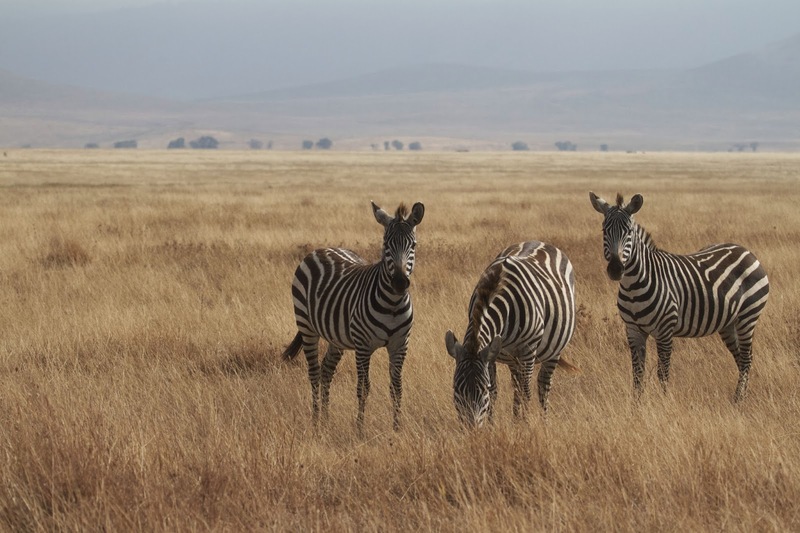 We could hear zebra snorting around us but couldn't see them until we were almost on top of them. 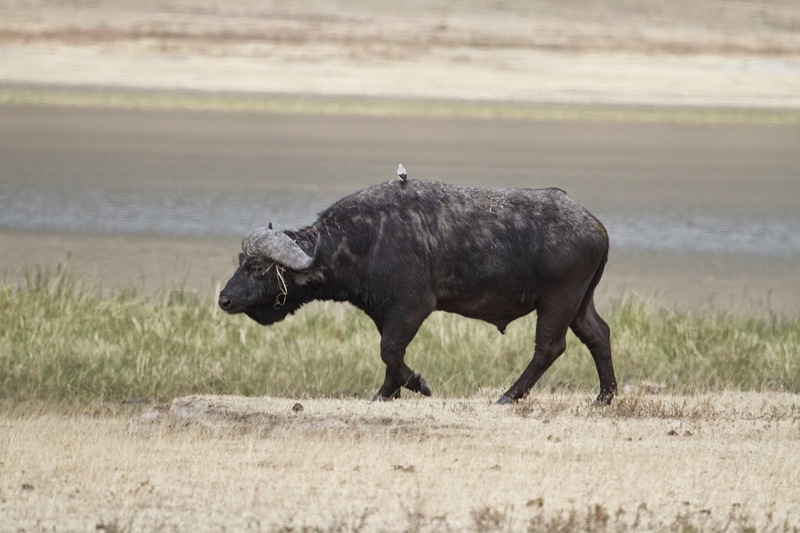 Our biggest fear was stumbling over a cape buffalo; those guys are known to be really grumpy, especially the bachelors that we knew were nearby. Back at the car, we silently apologized to our neighbors and started up the noisy diesel engine. We had to turn the lights on for the first time during the trip as we made our way out the campground road to the entrance where we were to meet Wilson. He appeared out of the mist near the entry shack. "We're a little early, but we can leave now if you want." He got in the passenger seat, and I crammed myself into the back. We had to rearrange the car the night before; there was a space just big enough for me and the camera equipment back there. Out on the road it was even more foggy, if that was possible. Between the dirty windshield and the heavy mist we couldn't see more than a few feet in front of the car. We were among the first vehicles out so there wasn't any oncoming traffic, thank goodness, but once in a while we'd come around a corner to find a bus stopped in the road, picking up the morning commuters from the villages. 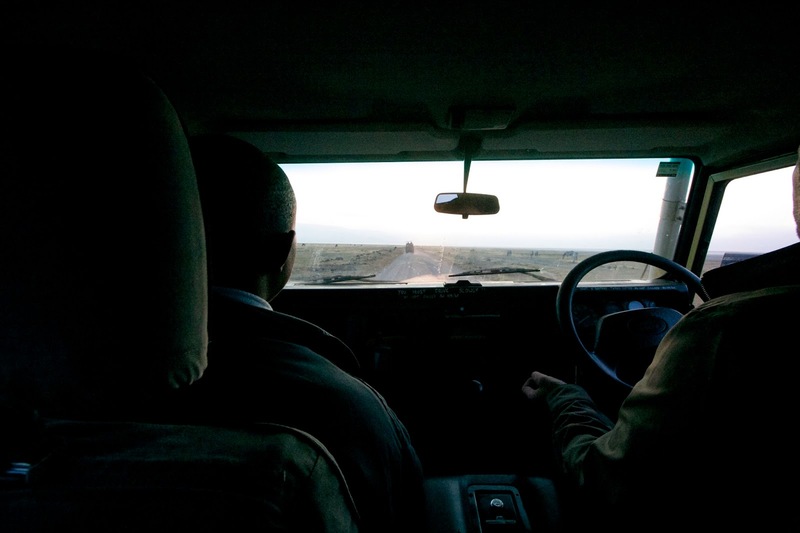 Ngorongoro roads were destined to be challenging for us no matter what time of day. 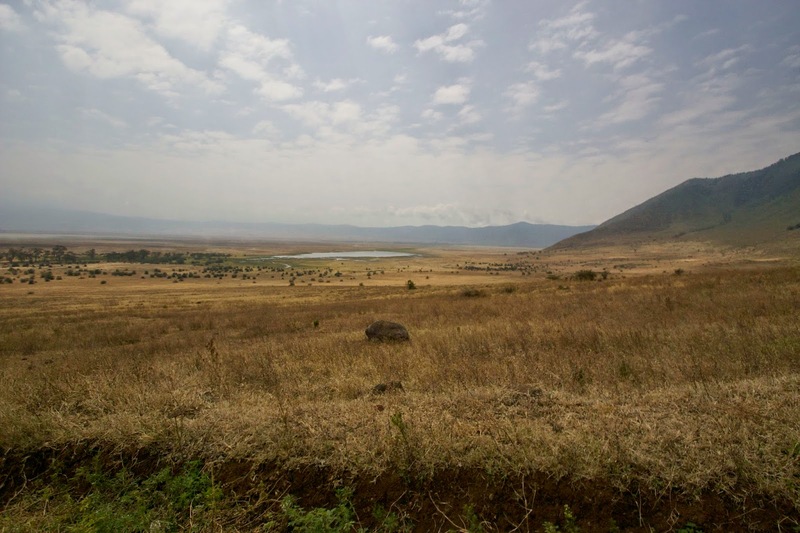 Ngorongoro Crater in the early morning light. We got to the crater entrance road and Wilson hopped out with our paperwork, checking us in at the guard shack. Thankfully the entrance road was one way because it was narrow, very steep and rough as it zig zagged down the crater wall. 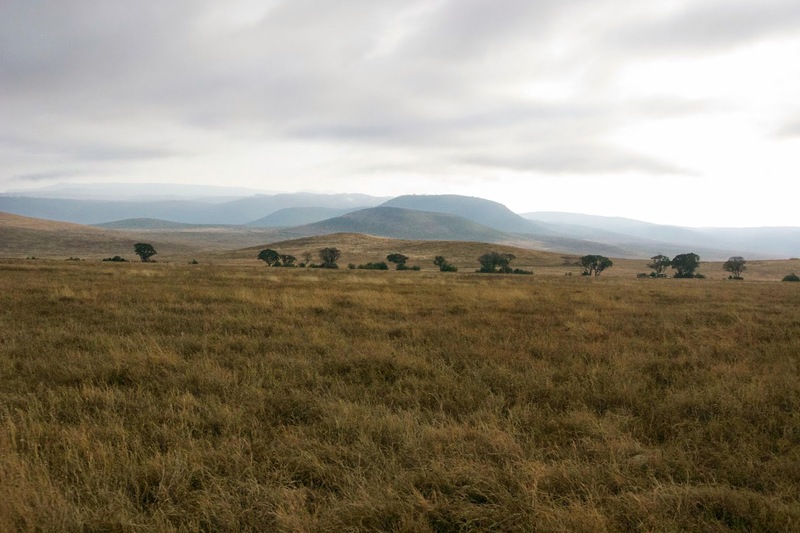 The sun was just starting to come up, and as we reached the crater floor the fog broke, revealing a huge grassy plain. Driving along the dusty roads in Ngorongoro Crater, Wilson pointing the way. 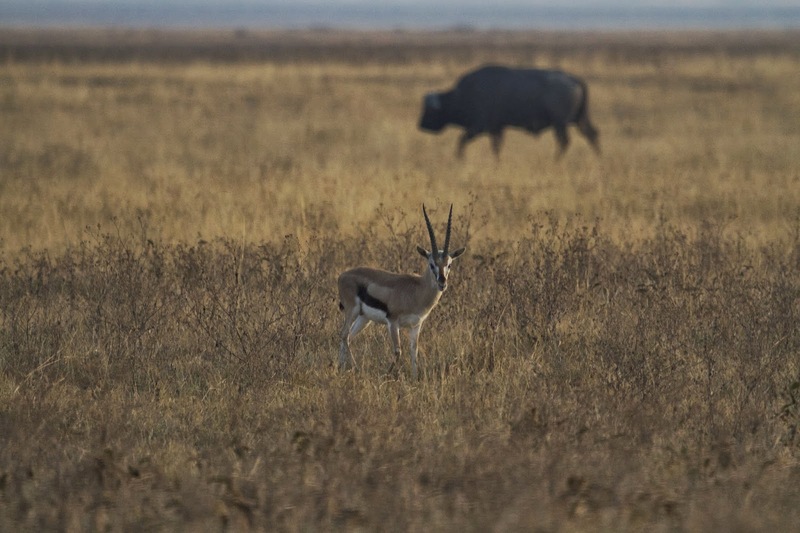 Wilson pointed out a herd of cape buffalo almost hidden by the tall grass near the road. 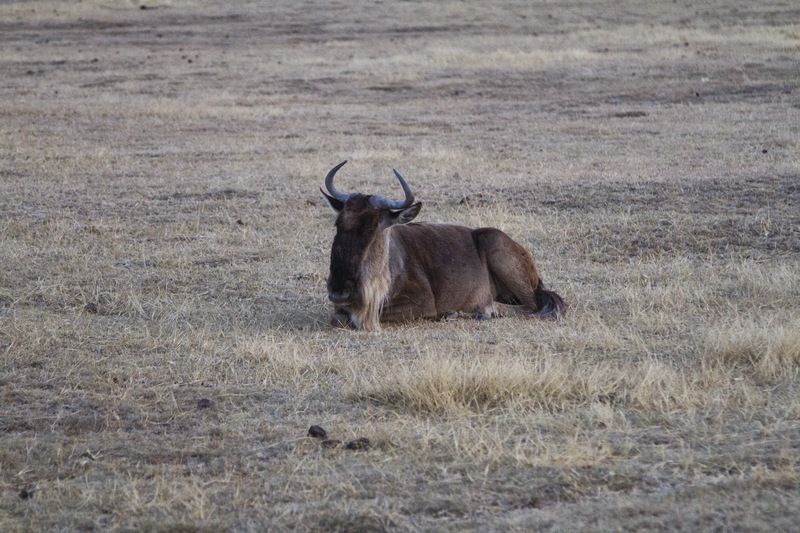 He told us that the older males without a herd of their own tend to hang out together for protection. 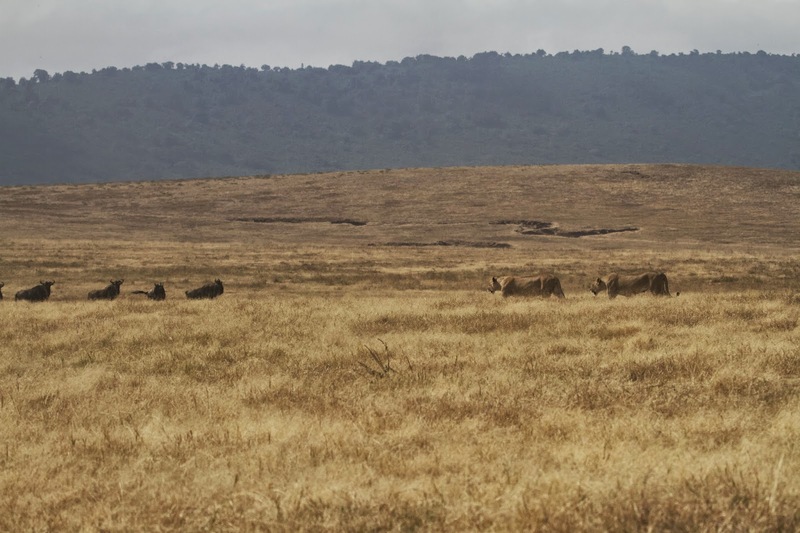 These bachelors always seemed to be in this area, munching on the tall grass with their backs to the crater walls, watchful of the lions that might be prowling around. Cape Buffalo with his trusty sidekick riding on top, a Yellow Billed Ox-picker eating insects off the buffalo's back. 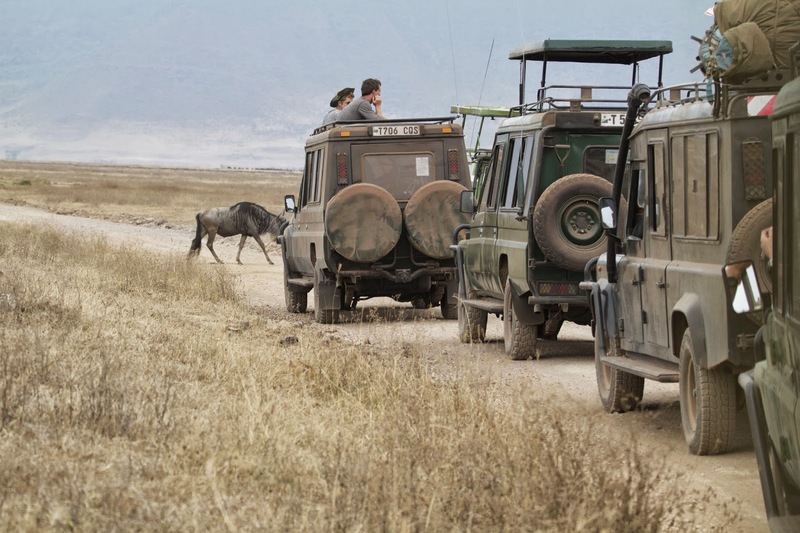 It was just past 6:00am, and we had followed four other safari vehicles down the access road. 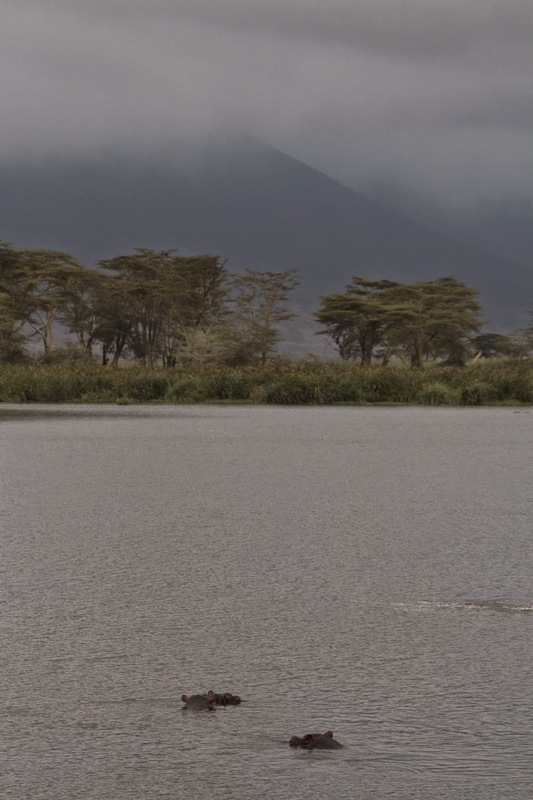 Wilson guided us toward the hippo ponds first; he said once the sun came up there would be many more cars coming in and the ponds would be very crowded later. So off we went. 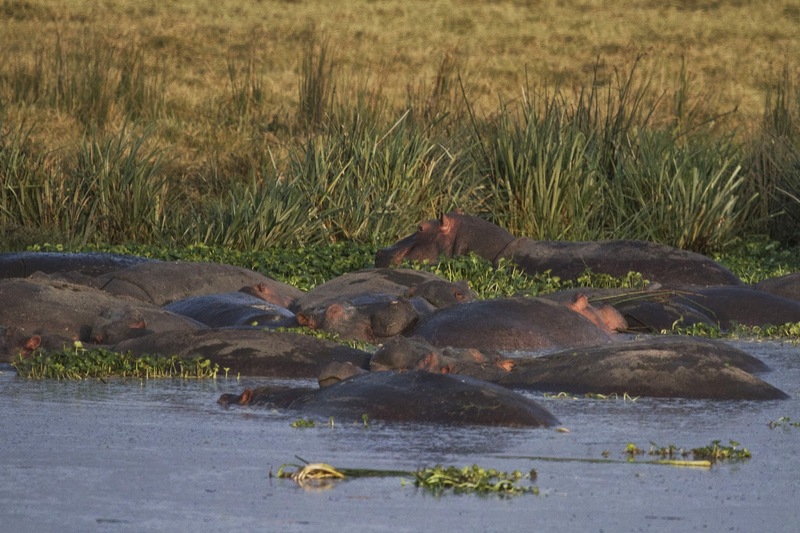 A pile of hippos in the Hippo Pond. A hippo keeps an eye on our noisy yellow car. 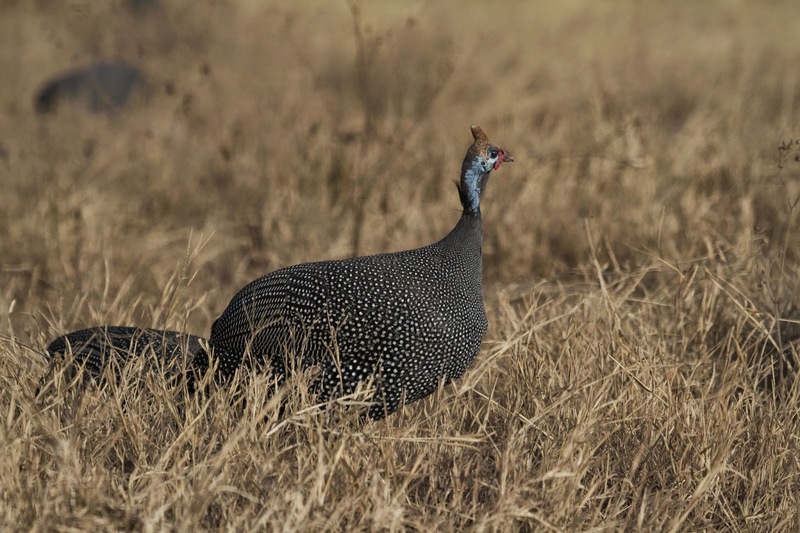 Ngorongoro Crater is loaded with game. 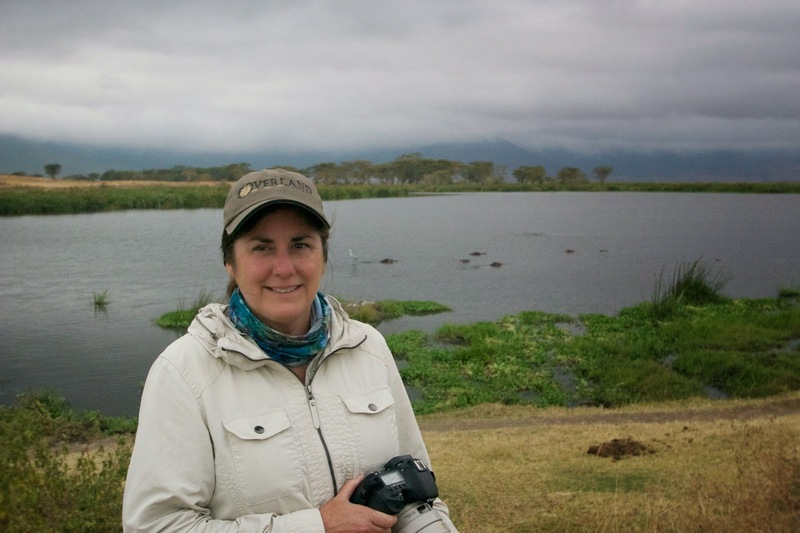 Everywhere we went there was an amazing sight: the hippo pond was chock full of hippos, the trees had huge cranes squawking in them, ostriches ran across the grassy plain. 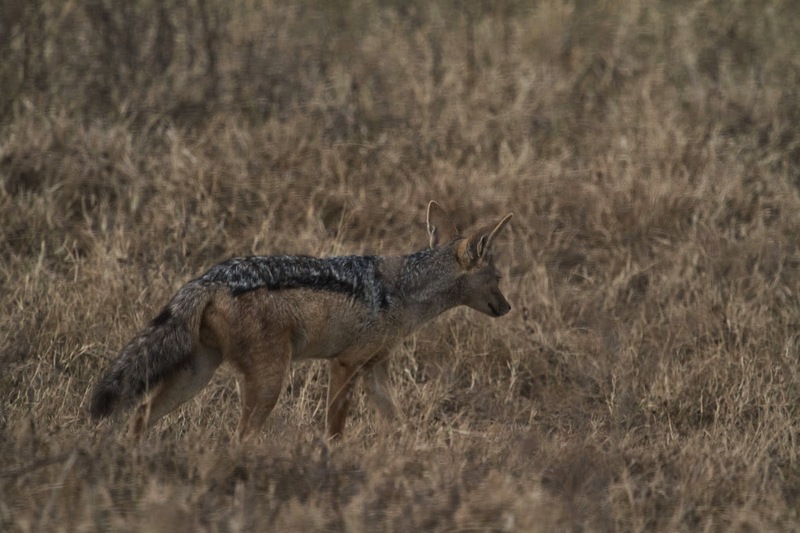 We came across a pack of hyena, adults lounging in the sun and the cubs wrestling with each other. Herds of gnus and zebra were everywhere often blocking the roads and staring at the vehicles as if to say "why must you be here so early?" 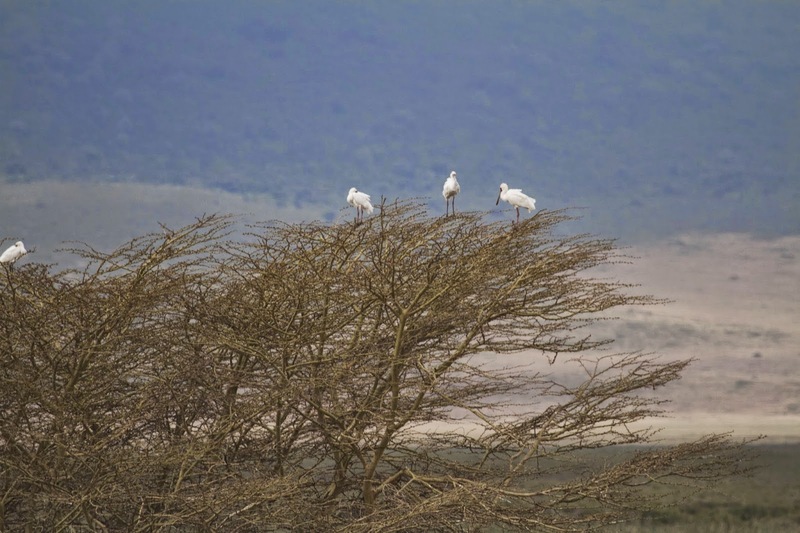 Cranes hang out in the treetops. 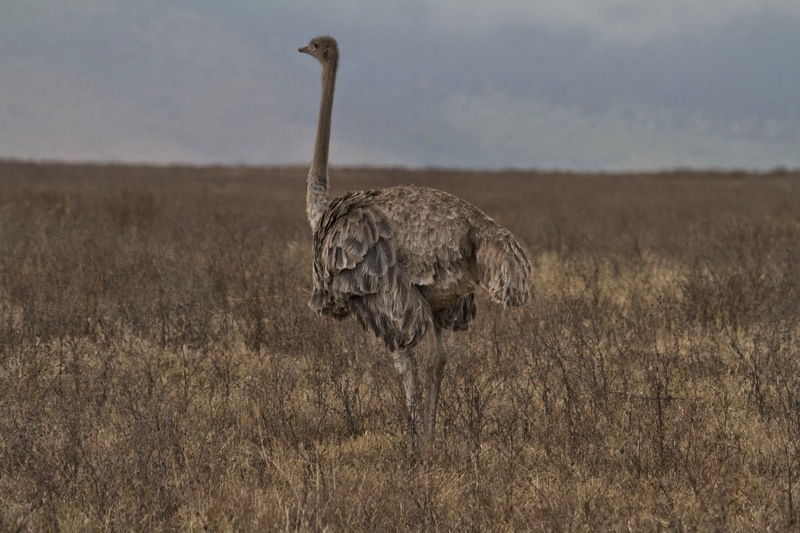 A female ostrich struts her stuff. 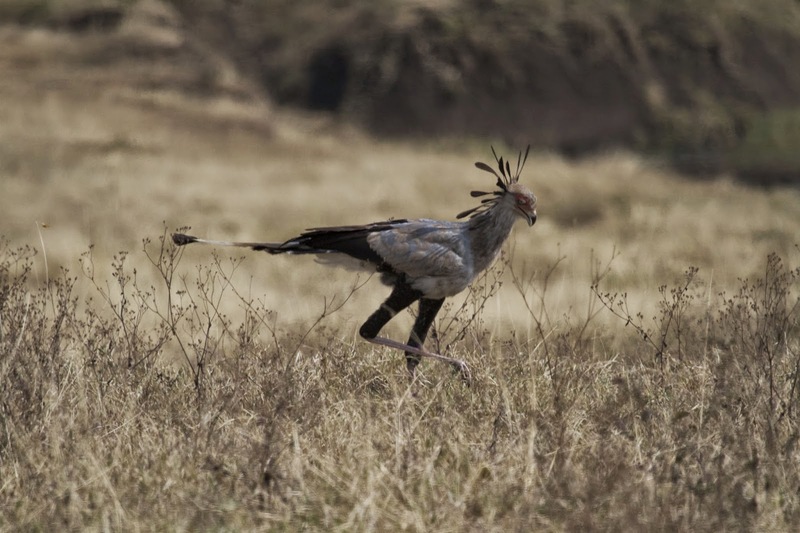 The Secretary Bird. This guy stomps on lizards and eats them for lunch. 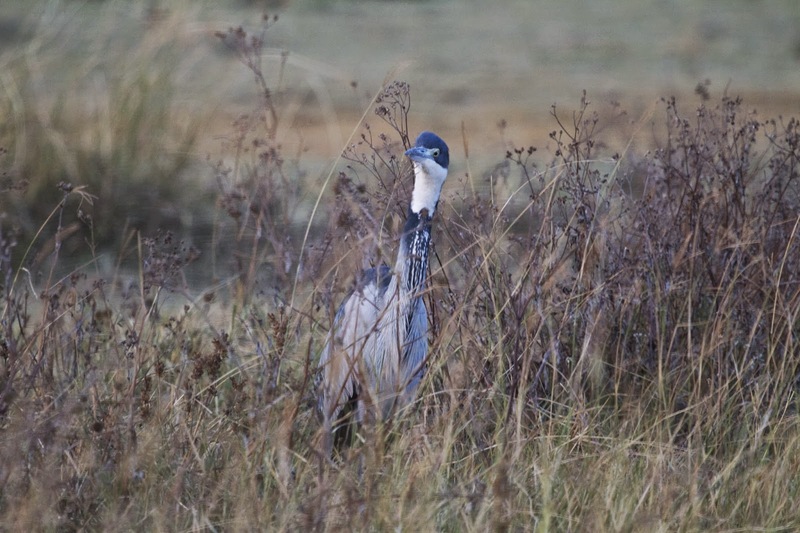 A bustard peeks though the grass. You heard it right. Bustard. 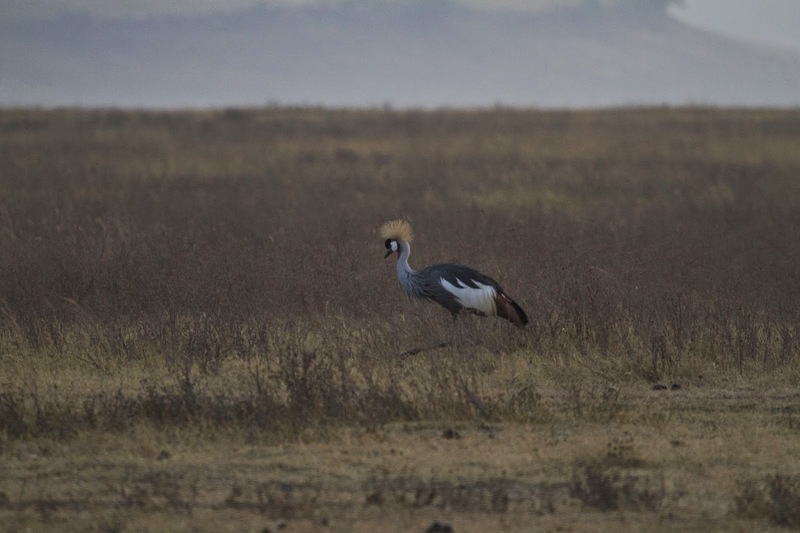 With a U.
Crested Crane, searching out a meal. 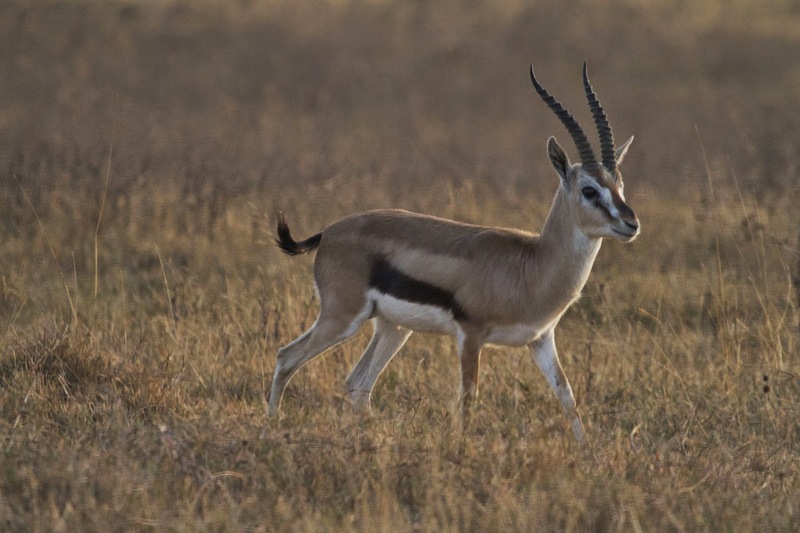 Gazelle in the early morning light. Gazelle, Cape Buffalo wandering around in the background. 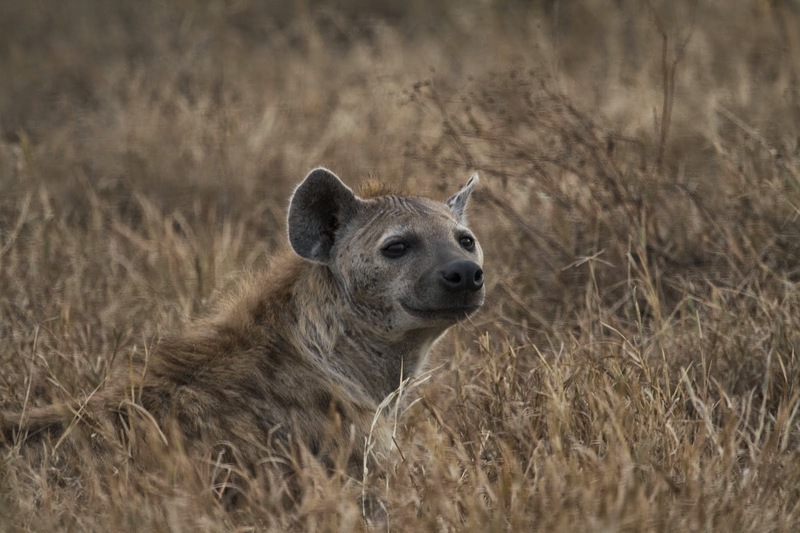 Mama hyena keeping a watchful eye on the young'uns. 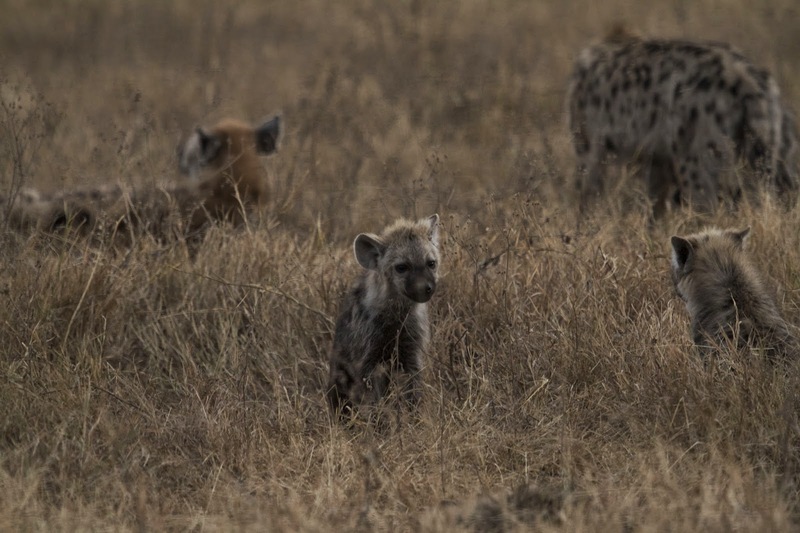 Even baby hyenas are kind of cute. 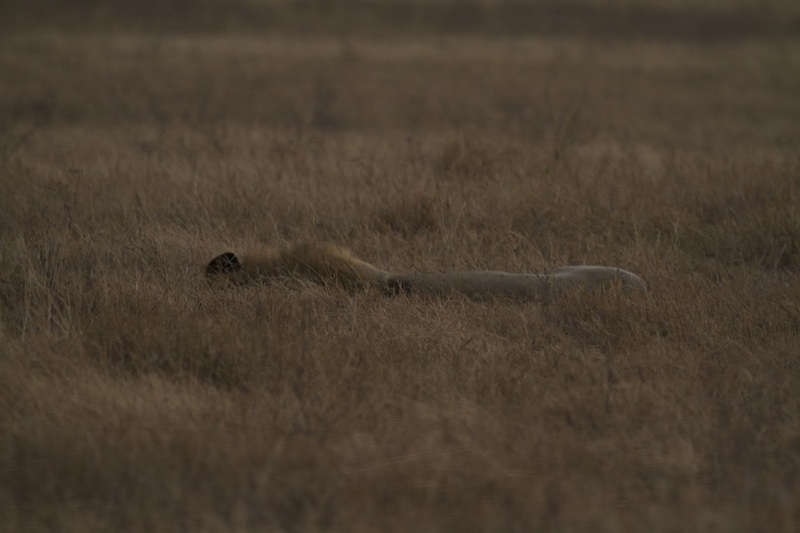 Exactly why you shouldn't wander around in the crater: a male lion is almost indistinguishable from the grass. "Hey baby. Come here often?" Life's tough when you're the king of the plains. 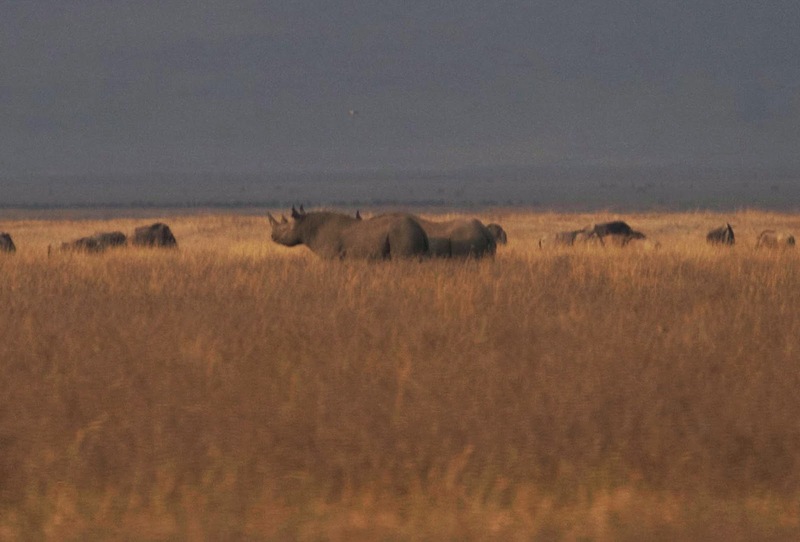 We spotted two black rhino way off in the distance. Even a kilometer away we could tell just how powerful and enormous they were. A ranger vehicle was off to one side keeping a close eye on them; Wilson told us the rangers keep them in view 24 hrs a day trying to protect them from poachers. So sad that it has come to this. We didn't feel so bad about the high park fees after hearing about their efforts, knowing our money was helping to keep the rhinos safe. After a few more hours in the crater we started to have trouble seeing game. It wasn't because there were fewer animals, it was the massive quantity of safari vehicles that were clogging up the roads. 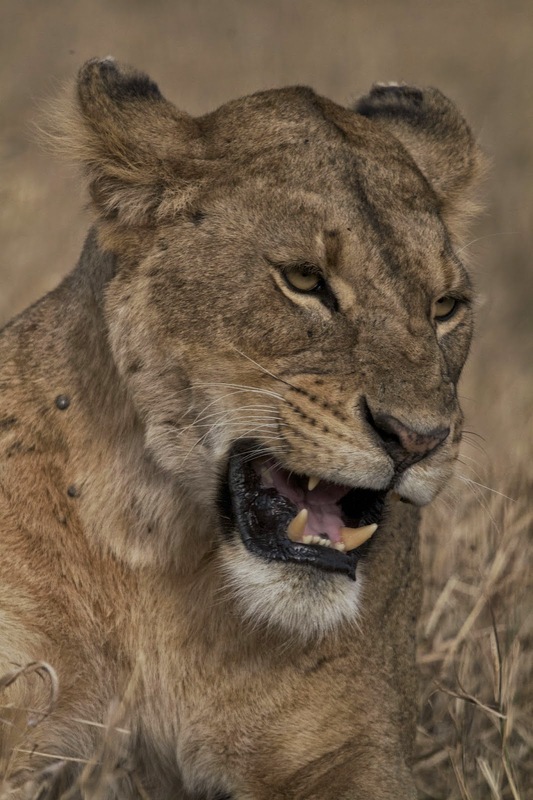 You could always tell where the lions were by the pileup of cars at a particular spot. 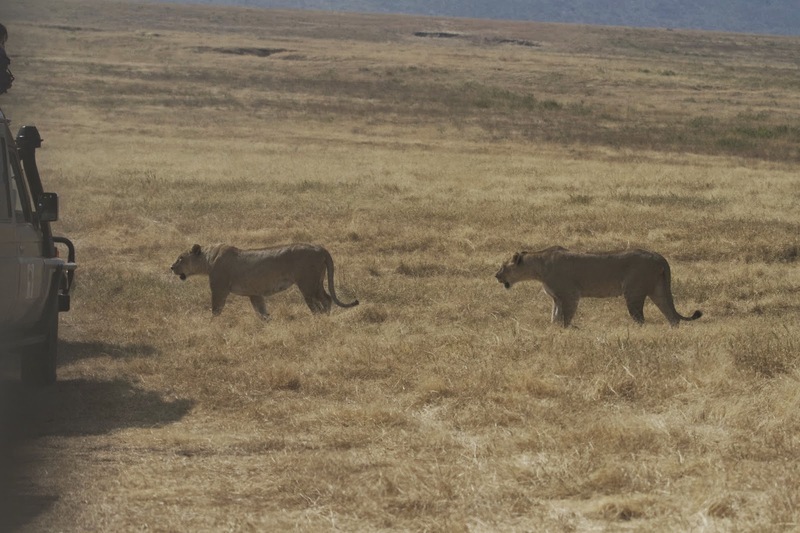 We came across a lioness and her two cubs, parking our car a bit away from them to give them space. Before we could get our camera focused five vehicles sped over and parked within inches of the cats, jostling with each other to get the closest. We ended up getting a few photos by idling by the parked cars, getting our shots from in between the bumpers of the other cars. We were very glad we had gotten up as early as we did and had a few hours in relative peace that morning. 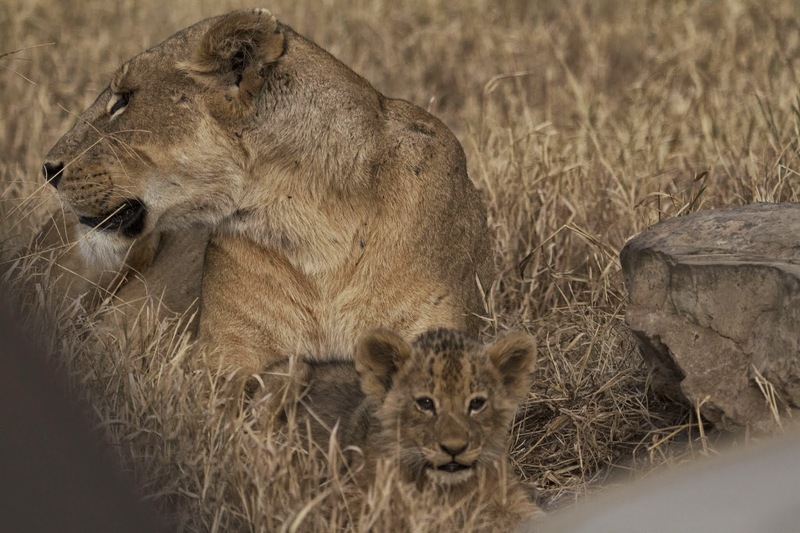 A lioness and her cub, as seen between two safari vehicles. We stopped in at the picnic area and had a belated breakfast. 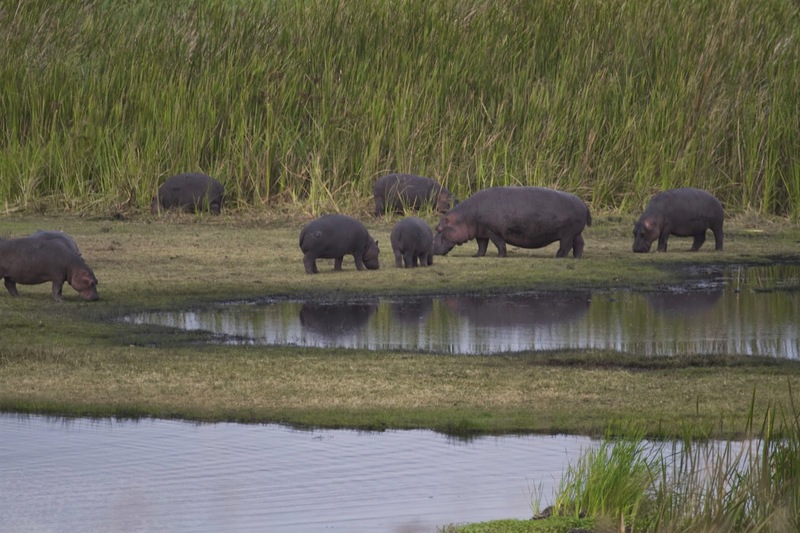 There were restrooms and picnic tables set up around a spring fed lake, which happened to be full of hippos. We were allowed out of the car here, which made us scratch our heads. 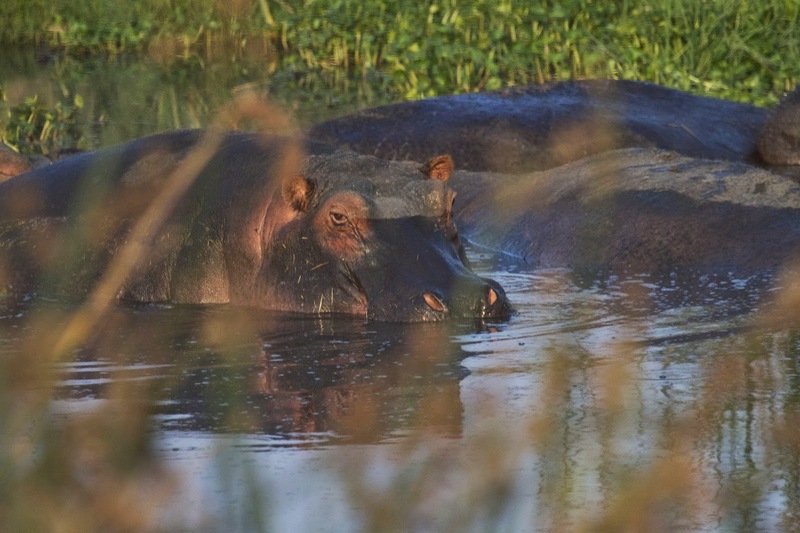 Hippos are supposed to be very dangerous, and here we were sitting within twenty feet of them. Africa is amazing and contradictory sometimes. 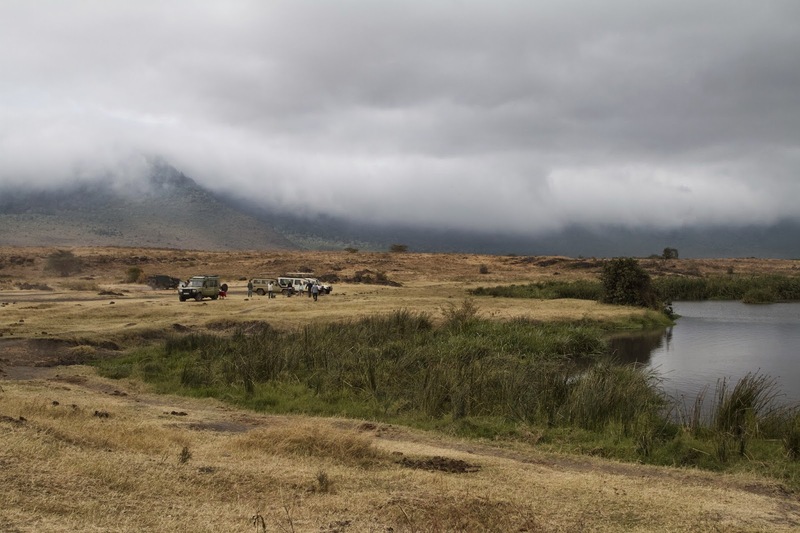 The picnic area, the clouds still gathered over the crater rim behind. 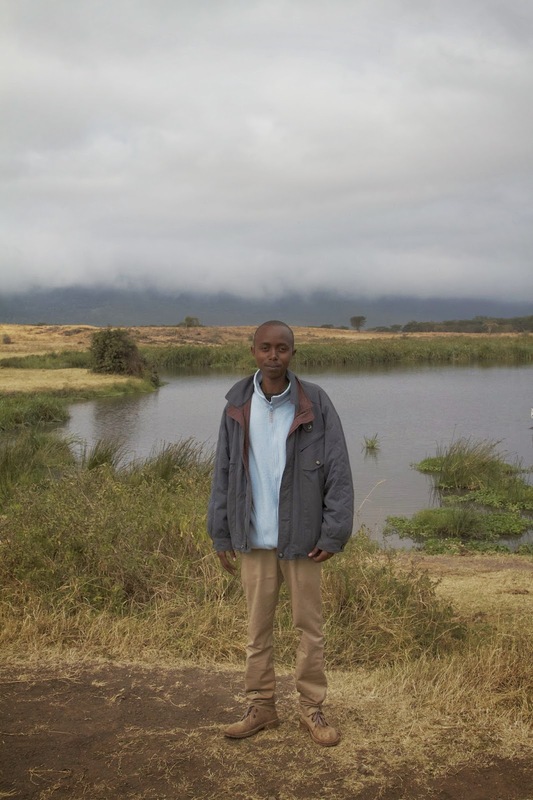 Me in front of the lake, hippos lurking in the background. Wilson, our intrepid guide/campground host. Hippo grazing alongside the picnic area lake. 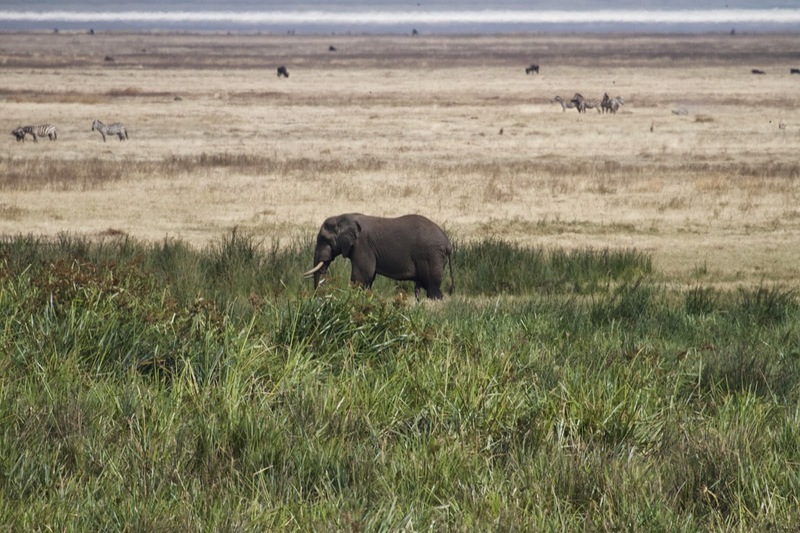 Huge elephant were grazing in the tall grasses next to the lake. 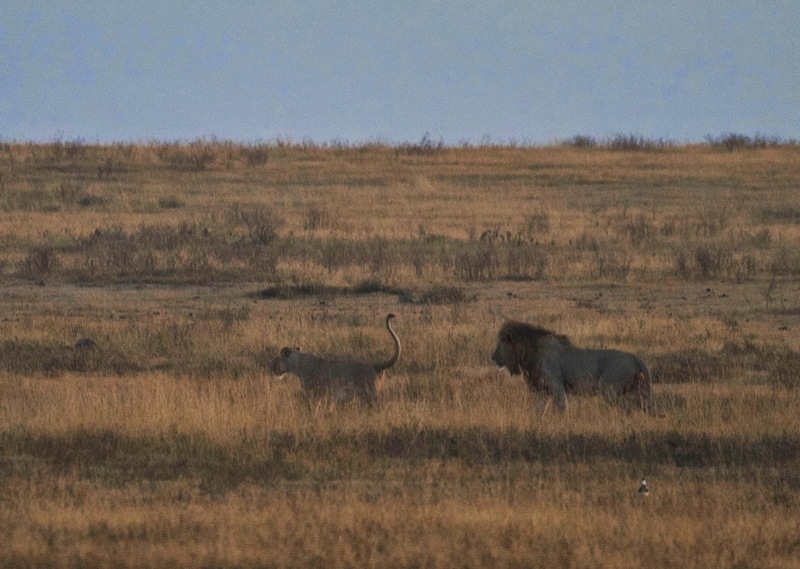 We came across two female lions stalking a group of wildebeest. 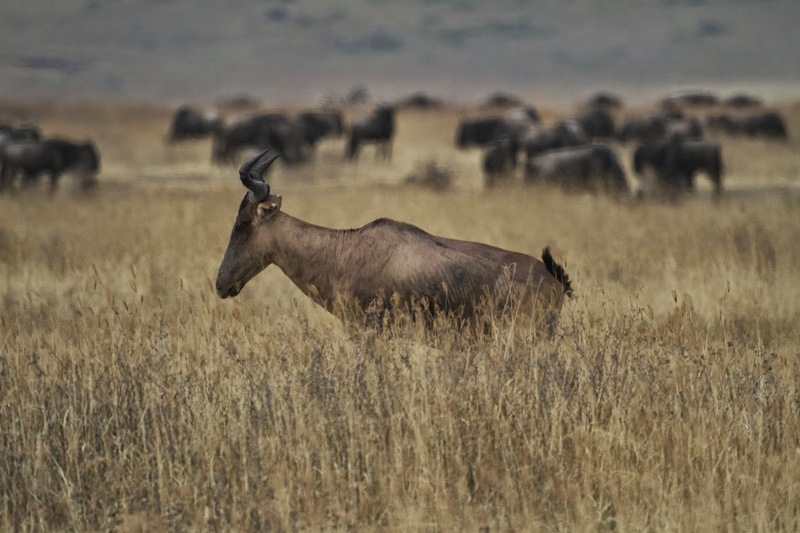 It looked like a practice run; even the wildebeest didn't seem to take them too seriously. They didn't seem to mind the audience of safari vehicles that were parked within 100 feet of them. In fact, they crossed the road right between the bumpers of two of the cars. 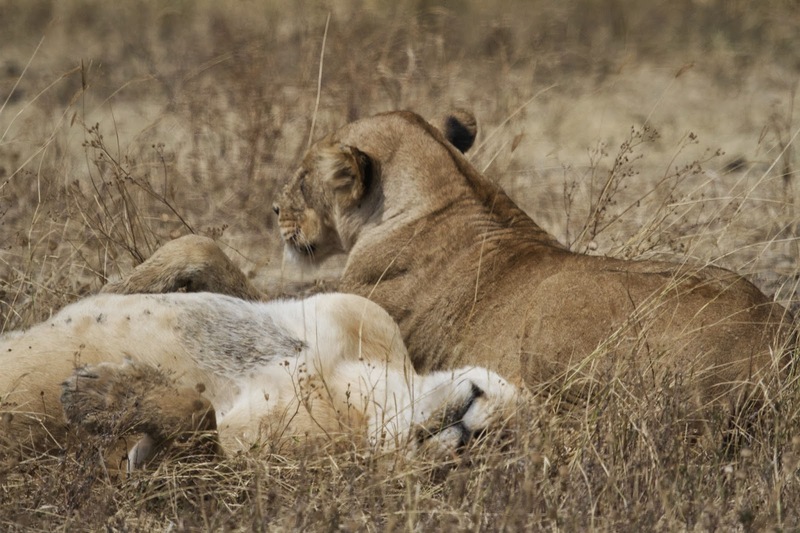 We watched as these two lionesses half-heartedly stalked some wildebeest. They gave up quickly and wandered across the road right between safari vehicles. The lions using the pedestrian crossing between vehicles. would pile up like flies on elephant dung. After a few more hours we decided to head back up the rim. The roads were now clogged with so many vehicles it was hard to get a good view of anything; besides we felt we had seen some pretty amazing things in the five hours we spent there. On the way out Wilson led us through the Lerai forest, where elephants were busy tearing limbs off trees and stuffing the branches into their mouths. Elephant in the Lerai Forest. Check out the thorns on those tree branches! 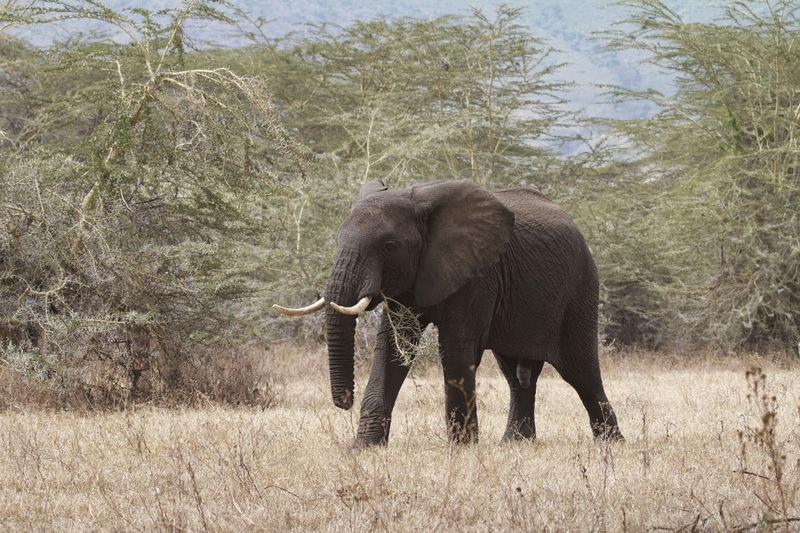 Elephants must have some tough mouths. 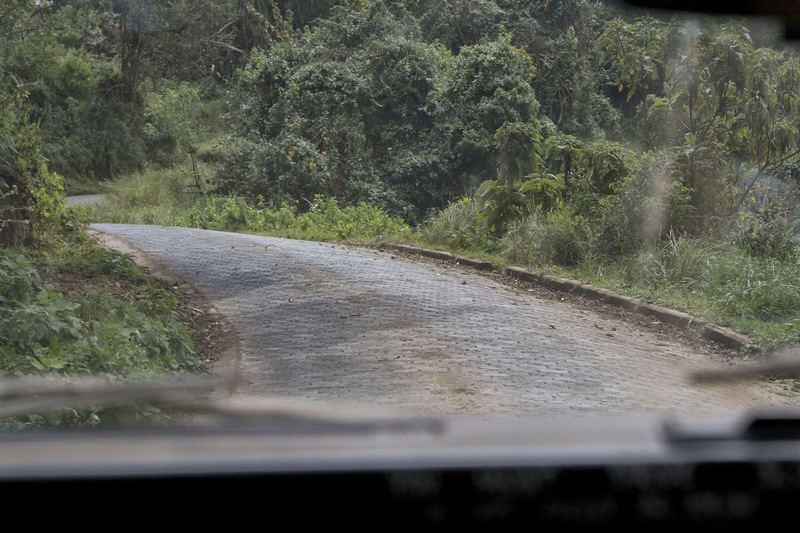 We came back up the one way* Lerai Road, astoundingly paved with bricks the entire way. I can't imagine how long that must have taken, with each brick having to be placed by hand. The "one way" Lerai Ascent Road, paved with gray bricks. Back at camp we said goodbye to Wilson. He had to get back to his campground host duties and we were exhausted and hungry after our early morning departure. It had been a fun action-packed day in the Ngorongoro Crater: Where else in the world can you see lions mating while stuck in a traffic jam? Looking back out across the crater from Lerai Road.